The 1888 Poughkeepsie-Highland railroad bridge has been re-engineered for pedestrians, hikers, joggers, bicyclists, and people with disabilities to enjoy the scenic view 212 feet above the Hudson River. High level-bridge at Poughkeepsie connects W to Lloyd just N of Mid-Hudson highway bridge. The Walkway Over the Hudson is the new incarnation of the historic Poughkeepsie-Highland railroad bridge. When first built in 1889, it was the second longest bridge in the world. 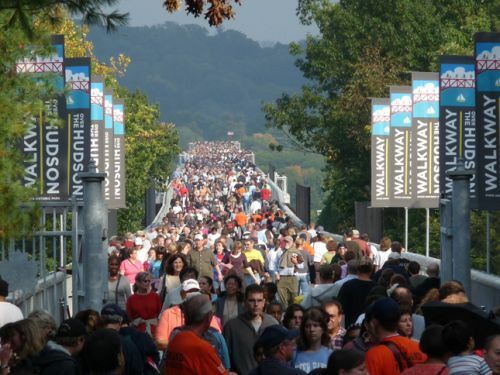 Walkway is the world's newest and longest bicycle-pedestrian bridge, and New York State's newest State Park. The bridge is 6,767 feet long (1.25 miles). The top of the bridge deck is 212 feet above the water. Its concrete deck is 24 feet wide over land, expanding to 34 feet at 3 viewing platforms over the Hudson River. Glass windows in the deck provide views downward to the bridge structure and Hudson River below. It is a world-class, close-to-home rail-trail that transforms a resource that history provided into a flagship for 21st-century health, recreation and tourism. The reconstruction of Walkway Over the Hudson is a Legacy Project of New York State's Hudson-Fulton-Champlain Quadricentennial. Walkway was open to the public on a regular event basis until deck reconstruction began in May 2008. Officially opened to unrestricted public access as a linear park under State Park management on October 2, 2009, the State's Quadricentennial celebration, attended by the Governor, a wide variety of Federal, State and local officials, and thousands of members of the public.